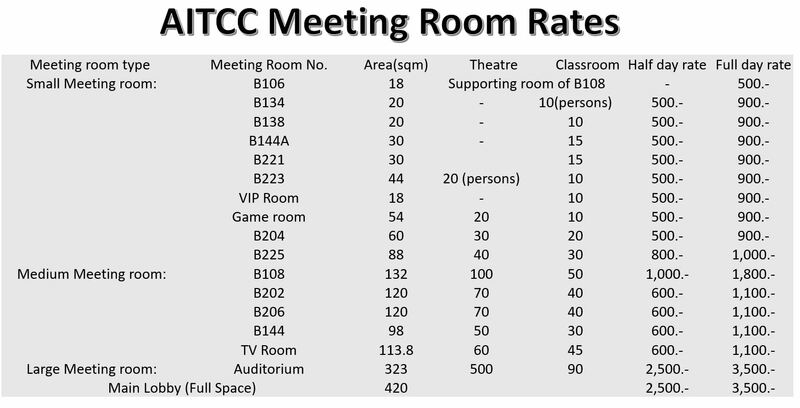 Note : Above rates for the meeting rooms are applicable for AITian's only. 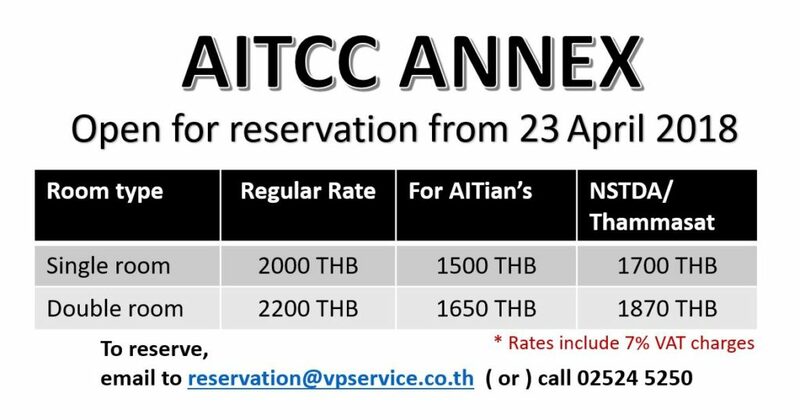 Others please contact AITCC reception @ 025245250 to confirm the rates. Remarks: 1) Additional 200 Baht/person will be added to the room rate if breakfast is included. 2) Accommodation and meeting room rates are exclusive of 7% VAT. * Discount is applicable only on endorsement from SU President for activities like film show, cultural show and alike. For AIT official functions, the organizer’s has to provide the internal account number in advance to facilitate the quick process of internal charging. For private big event/party, minimum deposit of 30% should be paid at least 2 days in advance. 7% VAT applies to all booking of accommodation and meeting rooms. Food catering / lunch boxes and drinks from outside are not allowed inside the Auditorium and the meeting rooms. Food catering from outside at dining is allowed only on special approval and extra service charges are applicable.